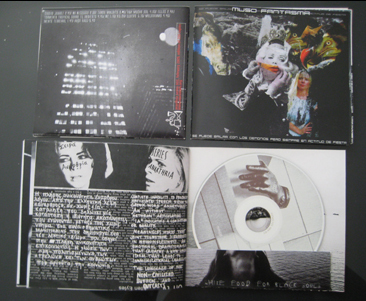 Discription: Limited edition of 250 copies, 50:00 mins, 3 pages booklet. Muso Fantasma is a Spanish duo. You might remember them from their collages in our 1st issue of Random Magazine. Pedro Amodio is from Argentina. He was a member of several bands. The most famous was Dios mixing punk and dark wave sounds with great spoken lyrics. Adriana Petit is also a collage artist with a unique temperament. Now they are working together creating music and collages. This is their first release album and our 2nd in the “anarthria” series. Their music is like a trip to unknown and gostly places. a collage of sounds with dramatic melodies. They use samplers, effects, keyboards, electric guitar and industrial percussions. The artworks are made by Muso Fantasma making this release a real art object!